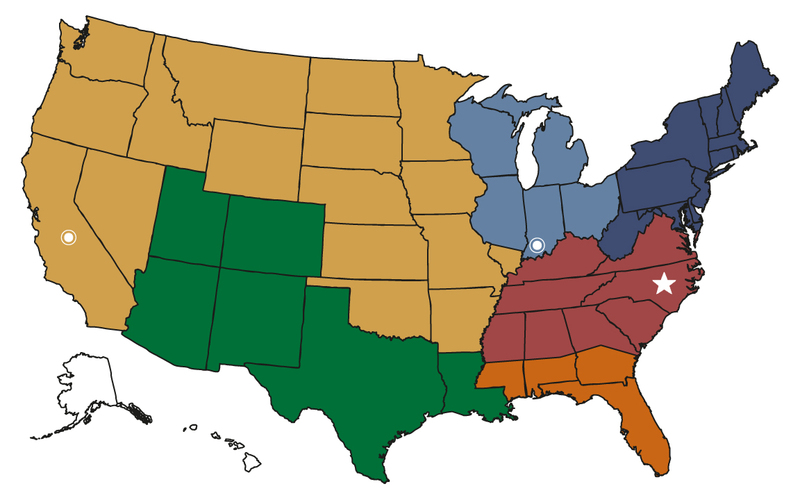 Our Middlesex, NC corporate headquarters and distribution facility, combined with distribution facilities in Evansville, IN and Fresno, CA enable us to deliver any order to anywhere in the US quickly and efficiently. Click on any button for sales rep contact information. Most orders can be shipped on the same day, whether it’s a case or pallet quantity. We also have the capability to ship direct to your customer, saving you time and money. Order what you need, when you need it, and control your inventory. We offer a “build a pallet” program, allowing you to buy multiple products to build a pallet (36 cases) and receive pallet pricing for the respective products purchased. Hover over any region for sales rep contact information. Most orders can be shipped on the same day whether it’s a case or pallet quantity. We also have the capability to ship direct to your customer, saving you time and money.